Smartphone-tablet hybrids, known commonly as “phablets”, haven’t really managed to take off despite being available for some years now. While there have been some moderate successes, the form factor seems to have been largely overlooked in favor of small tablets like the iPad Mini, 7″ Android tablets, and the Amazon Kindle Fire Amazon Kindle Fire HDX Review and Giveaway Amazon Kindle Fire HDX Review and Giveaway Is the Kindle Fire HDX worth owning if you haven't owned a Kindle before? To find out, we purchased a 16 GB Kindle Fire HDX 7" (Wi-Fi) without special offers for $244, and we're giving... Read More . Phablets have had problems, such as weight and thickness, which makes them difficult for many to handle comfortably – so what’s the point of the Samsung Galaxy A7, a phablet with typically large screen running Android KitKat? With a striking 5.5 inch Super AMOLED full HD capacitive touchscreen display and 151mm length, this phablet weighs just 141 grams and ships with Android 4.4.4 KitKat preinstalled, with a 5.0.2 Lollipop upgrade rolling out around the world. Two models of the A7 are available. We’re reviewing the 3G dual SIM model (the other is a 4G/LTE with support for a single SIM), which costs $400 unlocked. Processing is courtesy of a quad-core 1.0 GHz Cortex-A53, while the GPU is an Adreno 405. The device has 2 GB of RAM and 16 GB storage, but this can be expanded with a microSD card up to 64 GB. The SIM and microSD Make The Most Out Of Your MicroSD Cards Make The Most Out Of Your MicroSD Cards Read More slots are situated on the right-hand side of the phone. On the dual SIM model, the microSD doubles as a USIM slot, but using this means that you don’t get the benefit of the additional storage. The Samsung Galaxy A7 has a 13 MP rear camera and 5 MP front camera, which are augmented with some clever software. Power comes from a non-removable Li-Ion 2600 mAh cell, which can last up to two days with medium usage. Wireless LAN on the 802.11 a/b/g/n specification is included, with Bluetooth LE (low energy) also available alongside the usual Accelerometer, proximity, compass, and light sensors. Although I’ve had some large phones over the years, the A7 is the first phablet that I’ve spent enough time with to form an opinion. First impressions are good: it is light, thin (Samsung’s thinnest phone yet, at 6mm) and the power and volume buttons are surprisingly easy to reach. The finish on the back is strange, however. While the sides seem to have a powdered finish, the back feels just a little bit too plastic-y when compared with the rest of the device; as if the wrong back panel has been fitted – it’s out of place. Booting up for the first time, the phablet will ask you to sign into, or create, a Samsung account in addition to signing into Google. This can slow things down a bit, and depends really if you want to invest any effort into the Samsung eco-system. Long-term Android users moving to Samsung for the first time may not find much benefit in this; as a Samsung Galaxy Tab 4 Samsung Galaxy Tab Pro 8.4-inch Review and Giveaway Samsung Galaxy Tab Pro 8.4-inch Review and Giveaway The Samsung Galaxy Tab Pro is a solid performer. Just how solid? Read More owner, I’ve yet to find any compelling need for Samsung’s apps and their app store. When you finally get to unlocking the device for the first time, however, things come alive. A swipe up is heralded with a greeting chime as the device unlocks and reveals the Touchwiz UI, which is fast and responsive. The inclusion of Flipboard as a Google Now replacement Supercharge Your Online Reading With The New Flipboard Supercharge Your Online Reading With The New Flipboard The third generation of Flipboard comes with a brand new design – and the claim to be called the world’s best personal magazine. Read More (the HTC One devices use Blinkfeed in the same way) from the home screen is welcome, although what it offers is quite different. Along with the UI, apps and games just whizz along, with requirements such as connectivity and graphics supported without any lag. I have a few games in my collection and gave several of them a go, with absolutely no problems to report. In fact, the A7 gave the best performance I’ve seen on XCOM: Enemy Unknown on any Samsung device I’ve seen to date. With Antutu Benchmark What Does AnTuTu Benchmark Actually Measure? What Does AnTuTu Benchmark Actually Measure? Here's what AnTuTu, the popular benchmark app for Android, is actually measuring and what each benchmark means for real-world use. Read More installed, the results are also impressive. Put simply, the Samsung Galaxy A7 phablet is the 10th highest performing device available right now. In a market filled with high end flagships and cheap Chinese imports and clones, finding a phablet that is at the top end of the chain with a good specification is encouraging. To get an idea of the camera quality, I’ve compared the Samsung Galaxy A7’s camera with that of the Nokia Lumia 930. The latter has a Carl Zeiss lens with PureView imaging technology and 20 MP (rear camera) image quality, so offers a good benchmark in quality. How does the A7’s 13 MP rear camera compare? Well, it’s pretty satisfactory, actually, as you can see from the accompanying images. There is little difference with the Samsung Galaxy S6 camera, and the stills and videos from the A7 can stand alongside the Nokia Lumia 930. Photos have strong, realistic colors, and the HD video quality is crisp and smooth (although there is some strobing when panning). Naturally, you want to know how easy it is to take a selfie. The A7 offers two options. The first is to use the front facing camera in selfie mode, which requires you to line up the shot and then raise your palm to start the default two second countdown (as you may have seen on other Samsung Galaxy devices). The results here are good. You can also use the 13 MP rear camera for selfies, which works by detecting your face, and there’s also a panorama/selfie mashup tool for creating wide angle selfies for group shots. Some Android users like to customise their phones by unlocking and installing custom ROMs. 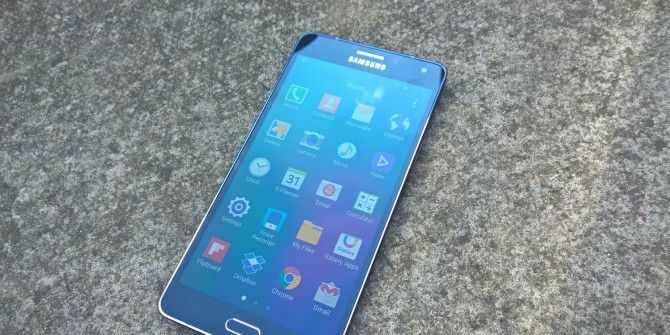 While the Samsung Galaxy phones have many custom ROMs, the same cannot be said of the Samsung Galaxy A7. Worse still, rooting can be difficult. The version we’re reviewing and giving away cannot be rooted using the Odin software (as with most Samsung models) and there is (at the time of writing) no firmware for the 3G model. With this phablet as your new smartphone, you’ll find little to complain about. The 5.5″ screen improves the gaming and videos experience considerably, while the slimline dimensions makes it surprisingly easy to hold. But the A7 has some quirks; for instance, the lack of a flashing LED notification light, and the unusual finish on the reverse. Also, the buttons either side of the Home button only light up when touched. On the whole, however, this is a refreshing Android experience. Send your products to be reviewed. Contact James Bruce for further details. "Smartphone-tablet hybrids, known commonly as “phablets”, haven’t really managed to take off despite being available for some years now." Just checked to make sure I wasn't dreaming. Apple released an iPhone 6 plus this time last year. Same size. Am I missing something? Perhaps its sales haven't been so wonderful? Also looked at your photo comparison. Because of the way you've written it, I couldn't quite understand which device you feel is better. In your example, the Samsung is a lot better. Sharper focus across the whole image (check the definition of the petals and the black centre of the flower). Also, the Nokia seems artificially bright. It's no longer a benchmark. Nor are Apple products in the real world. I have a Note 3 (I think it's sort of an equivalent - has a stylus and seems to be the same layout), which replaced a Note 2. My next phone will be the Note 5 (or 6 - I'm in no hurry to replace the 3). i like to win. im using samsung galaxy 2 for so long and i want to try it. hoping. hehe i need to win this... thats my dream phone!!!!!!!! "Wireless LAN on the 802.11 a/b/g/n specification"
The 'a' standard, is that the one created prior to the release of 'b' or the latest one release after 'n' called 802.11 ac ? come on man... it easy the code is at the end of the film. I am blind, and can’t read the code in the video. Is there an accessible way to get this code? Just being curious, have any Indians who have entered the MakeUseOf giveaways ever won anything????? the amount of times i have read these types of comments is unreal. I can say the same thing about my country. So can everyone else. Where is the review video? But secret code does't much. Well, I see what happened. It was correct the first time.